Decks constructed around above-ground pools are no different than any other freestanding deck. They should not be attached to the pool for any stability. The pool is essentially just adjacent to the deck. 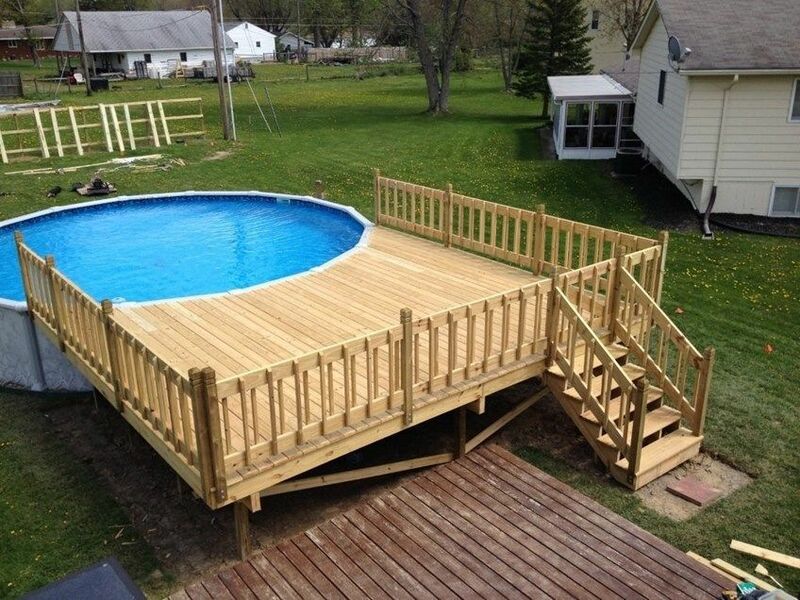 For most above-ground pools, these decks will be anywhere between 3 to 6 feet above the ground and must be laterally braced from the beams/joists to the bottom of the posts. Cross-bracing in these regions and in both axes (north/south, east/west or such) is necessary. At common pool heights, embedding posts in the foundations will not be sufficient for lateral restraint. New building codes addressing decks around pools should also be considered. The maximum gap between the decking and the pool coping is generally 3/4 inch. Slip resistance, gaps between boards and slope of the deck may also be regulated depending on the local codes. These design requirements should also be considered for any deck adjacent swimming pools or hot tubs, whether in or above ground. We recommend building the pool deck directly under the lip of the pool edge. It is best to set a series of segmented beams and footings about 2' from the edge of the pool to support around the curved sides. It is a good practice to install joist tape over the top of joists to protect from standing water. Installing a self closing gate may be required to prevent access for unsupervised children. 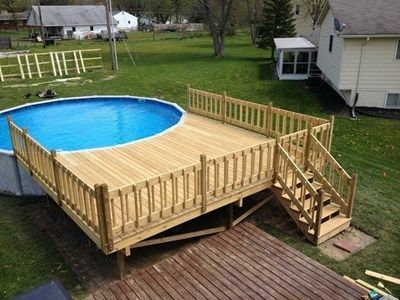 Installing extra blocking will reinforce the frame because of the added activity and variety of uses on pool decks. Use gravel under the deck to help with water drainage. Check out our free pool deck plans.